I figure either no one is going to read this, or there will be twice the usual number of visitors, depending on whether our audience is unable to tear themselves away from the car crash that is the election or they are desperate for distraction. If you’re looking for a break from the constant updating of whatever site you’re following, this puzzle is pleasant enough but doesn’t take very long, so you’ll be done before you know it and back to refreshing. It’s a Wednesday that plays like a Monday, at least for me. 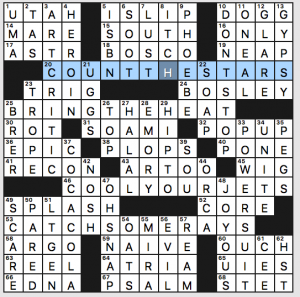 This puzzle is firmly set in the sports section, not the front page. We have four phrases that are clued as exhortations to the coaches of teams from the Big Four American sports. 20a [“Coach, make sure everyone’s here” [N.H.L.] ] = COUNT THE STARS. The Stars. This phrase didn’t seem all that familiar to me, although Google tells me there was a punk band by that name. “Number the Stars” is a YA book about the Holocaust and the phrase I usually think of. 25a [“Coach, get ’em to today’s game” [N.B.A.] ] = BRING THE HEAT. The Heat play basketball in Miami. 46a [“Coach, get those guys a little ice water” [N.F.L.] ] = COOL YOUR JETS. The New York Jets (who play in New Jersey) seem pretty cool this year. In fact, they seem downright cold. 53a [“Coach, nab a few of those curfew violators” [M.L.B.] ] = CATCH SOME RAYS. I liked the team name better when they were the Devil Rays. They play baseball in Tampa. 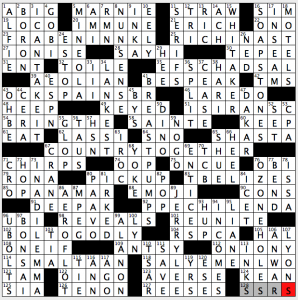 How did anyone every create a crossword before UMA Thurman hit it big? 18a [Classic chocolate syrup brand] = BOSCO. I remember Bosco! Sigh. We have the contrast between [Passionate desire] at 7d and [Persistent desire] next door at 8d. LUST and ITCH, respectively. 10d [1992 Clinton campaign song] is not a reference to this year’s campaign. Hillary is associated with Roar by Katy Perry. Bill was the one who played Journey – specifically DON’T STOP (Believing). A clue for ORCA that doesn’t reference the sea or use the word “kill” – 44d [“Free Willy” creature]. 33d [Tailored wear imparting confidence] is the POWER SUIT, which I suppose may be part of an election mini-theme with 10d. That particular term has an ’80s Nancy Reagan vibe for me. What I didn’t know before I did this puzzle: that PEGS are required to play croquet. I only knew about the wickets. Blogging while watching election returns so this is really going to be brief. We’re adding a Y to certain phrases with some, but not all, resulting in spelling changes. 17a [Sure way to do in your oxen?] POISON YOKE. Poison oak. 21a [What the number of candles on a carrot cake signifies?] RABBIT YEARS. Rabbit ears. 35a [Bark of a deadly puppy?] KILLER YAP. Killer app. 54a [What causes the center of the dough to rise?] MIDDLE YEAST. Middle East. 59a [Editor removing a story before it can run?] NEWS YANKER. News anchor. I like RABBIT YEARS and NEWS YANKER, but POISON YOKE and MIDDLE YEAST don’t make much sense. We get great big 7×3 corners with interesting fill like RAPTURE, TRIBECA, CODICIL, and MOLOKAI, but we also get some iffiness in THE DELL and IN ROME. Okay. That’s all I have. As I’m writing this, the race is not decided but it’s coming down to the wire. The question of “Why?” seems very apropos at the moment. Once I had that revealer, it became immediately clear how to enter and parse the theme entries. From top to bottom, we have BENIN, CHINA, CHAD, SPAIN, IRAN, BELIZE, PANAMA, CHILE, TOGO, MALTA, and YEMEN brought together in the grid. 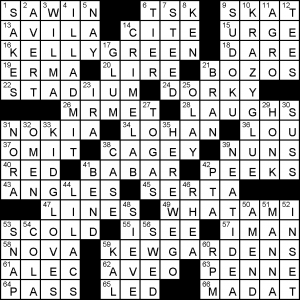 The rest of the grid’s fill is pretty good – sure, the number of theme entries constrains a few places and gives you the usual ACH, III, TIA, AMI sort of business in a few places, but also contains some lovely stuff like SOAPSTONES, MINEOLA, AEROFLOT, BREAST PUMPS, and BONSAI. Today I needed a little diversion after checking the news reports (and my Facebook wall) and I got around 30 minutes of it from this. The theme is CAGEY – K.G. initials. A simple theme, cleanly executed, using a pinwheel arrangement, which is arguably the best for a balanced grid. The theme answers are KELLYGREEN, brand KRAZYGLUE, idiomatic KIDGLOVES and the celebrated KEWGARDENS. The rest of the puzzle seems carefully crafted. There are no real jaw-openers, but a lot of colour, like MRMET, CRIMELAB, SUDOKU, WHATAMI and DORKY. This entry was posted in Daily Puzzles and tagged C.C. Burnikel, Francis Heaney, John Lieb, Mike Shenk, Tracey Gordimer. Bookmark the permalink. I believe the Clinton campaign song from ’92 was Fleetwood Mac’s “Don’t Stop (Thinking About Tomorrow)”. The clue on CATCH SOME RAYS the was strangely specific. Why curfew violators? Good theme, though, and good long non-themers. Yeah, you’re right. I blame election fatigue. Or something. Count me among those desperate for distraction. NYT: Isn’t this the second appearance for “Brer” in the past few days? It is, and both times clued by way of the Uncle Remus stories written by a white man imagining how black people talk. 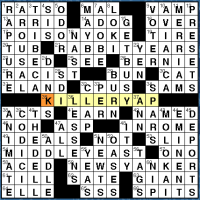 I also thought the clue for the Rays theme answer was strange. When I played croquet when I was young, I remember calling the pegs “stakes.” I assume PEG is the proper term. Thank goodness that’s over, indeed! ATAWHOGSL (hint: pretend there is a country named Wh0g). Yuck. Well, the country did vote to suffer.